Deciding on a pair of Motocross boots can be tricky business. On the one hand, you’ll want a durable, safe boot that will provide great protection and hold up for years. On the other, you’ll want one that doesn’t break the bank and is comfortable in all weather conditions. We’ll highlight some of the factors you should consider when choosing a boot so you can decide what’s most important to you. Of course, saftey should be your number one concern. Dirt bike racers frequently sustain ankle injuries that can knock them out of action for months. Look for any or all of the following features to provide the best level of protection: steel sole inserts, heat shields, polyurethane shin and calf protector plates, as well as shock absorbing heel pads. Many of the above safety features also provide durability. The stronger the boot components, the safer it will be and the longer it will hold up. 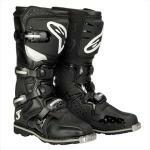 Some higher-end boots will also offer removeable soles that can be replaced when worn down. Since soles are often the first part of a boot to wear out, this is a great way to ensure your boot will last. Buckles are typically made of aluminum or plastic. Plastic will save you some money but will wear out more quickly. Unless you’re buying a custom-fitted boot, no boot will fit perfectly. But flexible panels in the upper, coupled with gel pads around the foot will ensure you get a snug, comfortable fit. Look for a removable bootie — this will allow you to adjust the fit around your foot to just your size. 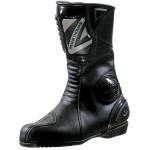 If your foot is a non-standard width, you may need to hunt around or to opt for a custom boot. 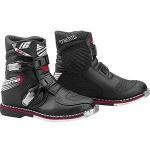 Mainstream boots typically are only available in a single, standard width. 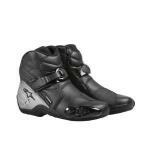 Alpinestars, with their Tech 8′s and Tech 10′s, has been recognized as the leader for quite some time. Gaerne, with their SG-10 model, has closed the gap, though. 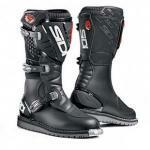 And Sidi has always been known for great boots. Expect to spend between $300 and $400 for high-end boots. You can get away with a bit less if you’re looking to save money and are willing to sacrifice some of the above features. Don’t go too cheap, though, or you’ll sacrifice too much. You’ll also want to consider the water-resistance of the boot. Many boots will have a gaiter — an insert designed to keep water out — that will do the job. Also consider the boot’s weight. All true racing boots will be lightweight, but if you’re concerned about every last ounce be sure to get accurate weight data before buying. 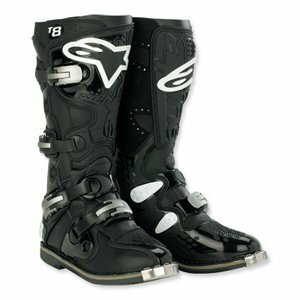 A special note about motocross boots for kids — while youth options are more limited than adult’s, many of the top manufacturers make smaller versions of their boots. While it makes sense to sacrifice a bit on durability of a boot, these boots typically do provide as many safety options as their standard offerings.